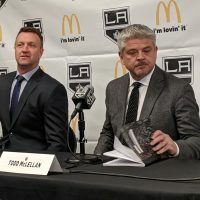 Kings GM Dean Lombardi has often talked about needing more ‘character guys’ in the Kings’ system, players willing to put team first at all cost. He’s probably found one in Kyle Clifford. If the small things, the intangibles, are what separates players at the pro level, Clifford stands on the proper side of the line. 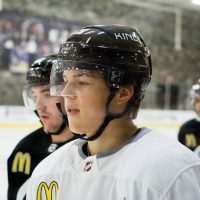 Having just endured a horrific return trip home from Team Canada’s World Jr evaluation camp, he still had the right frame of mind to be a ‘team first’ guy during our casual conversation about how things went for the group of Canadian youngsters participating in the sessions – including an NHL best, six from the Kings organization. This past weekend was just step one towards his goal of making the squad…a group that will be out for revenge, having lost the gold medal to Team USA at the most recent World Junior Championships. Well, there was some sort of mix up with the flights. They sent the wrong plane or overbooked it or something. First I had to sit around the airport for 14 hours before getting a flight back to Toronto. The airline stuck me in a hotel there and then this morning they flew me back to LA. How did you pass the time? I tried to sleep it out, but it wasn’t really happening. That’s a really long time to be stuck in the Newfoundland airport. They had a small Tim Horton’s, with some donuts and coffee…no sandwiches though. So, I was starving. After landing I hit the grocery store first thing. Now, as for the camp itself, you had a good showing, picking up a goal and three assists. Did you go up there with any particular mindset? I wanted to go in and play my game, the way I play it – which is hard nosed and gritty. I was able to put up some numbers – but all things aside, that’s not really my game. I tried to stay physical. So, I’d say that was my mindset – my bread and butter, which is what got me there. Playing physical in an evaluation camp can be a bit tricky. After all, you’re out there playing against your teammates in a sense. Last year, (fellow Kings prospect) Colten Teubert actually injured another camper. Did the coaches mention that at all or were you aware of what happened? 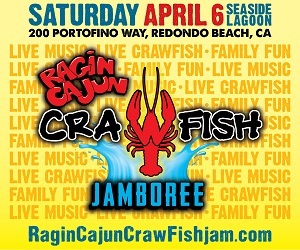 I heard about it during the camp from some of the guys that were there last year. It wasn’t too big of a deal, kind of a side topic. Guys know what they have to do and they can’t really be friends during the game. The way the camp is set up, you have to put friendships aside and just try to keep cooler heads when things happen. 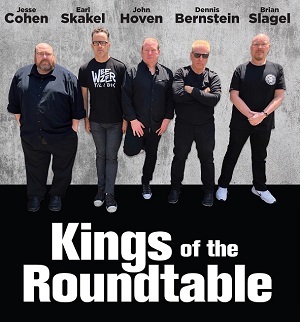 The Kings had more players invited to the camp than any other team. Was that something any of the players talked about off the ice? I’d say we all knew there were a lot of Kings prospects there. 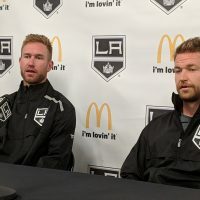 It was almost like another Development Camp with so many Kings players there. What, six out of 40? So, it was nice to go out there and feel comfortable and be around guys you’ve spent time with before. It just makes things a little bit easier. Along those lines, because of the familiarity from the recent Kings camp, did you guys end up forming your own clique? No. It was all divided, to the point there were only a few Kings prospects on each side and the two teams (team red and team white) didn’t hang out with each other. It was always nice to catch up with the other guys on the ice though, see how everybody was doing since camp in Los Angeles and stuff. Your team (team white) won both of the scrimmage games. Did that give you any extra confidence leaving camp? It’s always nice to win. That’s why you play the game, to win. It was good though. Out team clicked really well and I thought, for the amount of time we knew each other, we played our positions well. We read off of each other pretty easily. Over at the Team USA camp last week, they had a wiffle ball game on one of the off days. Did you guys have any good bonding sessions away from the rink? Our second day in we had a team event, where we all went out on a boat to go whale watching. It was pretty neat. We went around a couple little islands and then had a Newfoundland lobster and steak dinner. So, it was a good event for everybody to get out there and meet each other. Tell the truth Kyle, any pukers? Yeah, actually there was one. 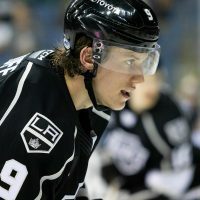 I’m not gonna say his name though because he is a Kings prospect. JF Berube (2009 NHL Draft, fourth round) – I thought in the second game he was rock solid. He played really well and seemed very confident in net. He made a lot of really big saves, including a big one on Schenner (Brayden Schenn) in the first period of that game. I thought he had a really good camp. Brayden Schenn (’09, first round) – Being a returning guy from last year, he was definitely one of the guys that people were looking up to. What you see with Schenn is a dominant player all the time, so he’s pretty good. 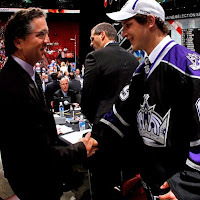 Tyler Toffoli (’10, second round) – He was good too. He scored a short handed goal in the first game. He kinda picked the goalie off. He had a lot of nifty moves and played with some real skilled players. He showed off some pretty good moves. Linden Vey (’09, fourth round) – Like all the Kings prospects, he had a strong camp. I thought he had two good games. Nic Deslauriers (’09, third round) – He was dominant on defense. He laid the body a lot and had a ton of shots on net. From seeing him last year to this year is unbelievable. He was also one of the players that went to the main camp last December, so he shared some of that experience with the other players too. Of that group of five, in your opinion, who was the most impressive at camp? I thought they all did well. Each had a moment where they shined. So, I couldn’t pick just one. You’re back in LA now – so, what are your plans for the rest of August? Well, I’ve been training in LA for most of the summer. 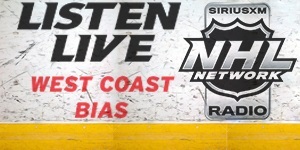 I’ve been here since around the start of Development Camp (end of June). Then, it was off to St. John’s (for the Team Canada camp) and now I’ll be here for a couple more weeks of training, getting ready for camp with Barrie (OHL). Then, I’ll fly back to Los Angeles for the main camp here. It’s a pretty busy schedule, but I’m getting used to it. That’s all for now. Kyle needs some rest after his own version of Planes, Trains and Automobiles. Early tomorrow I’ll be back with some player comments from the Team USA camp over in Lake Placid, NY. Let’s see how Kings prospect Derek Forbort and his group did over there.